The sixpence is missing from the invitation of course but if you really wanted to complete the rhyme you could always add one inside the card with a little glue dot. You pick up a bag of 50 or more original six penny pieces from Ebay for under £5.00. 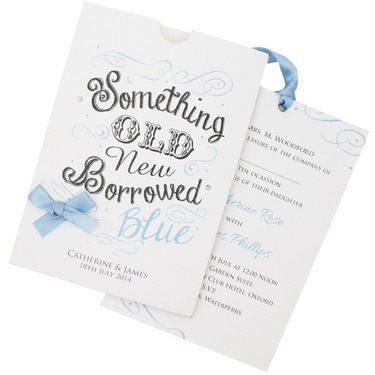 The beautiful cursive fonts are printed on textured, cream board, which give the invitation a classic simplicity. Simplicity is the main feature here, but the tastefully placed rhinestones, delicate swirls and pale blue bow embellishment add something quite special. 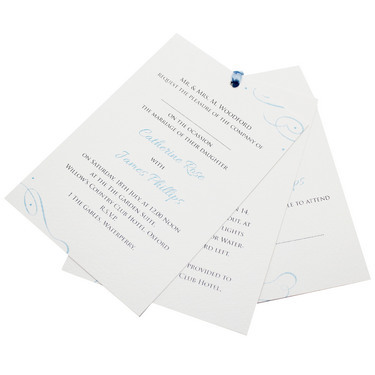 The invitations have a high quality professional finish which would be perfect for any sort of wedding. 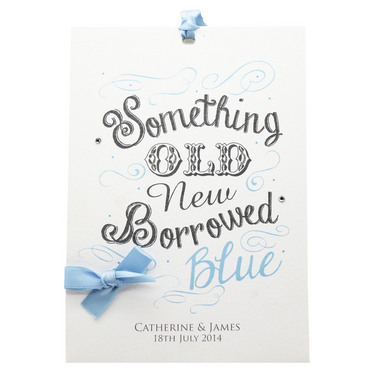 Your invitation can be personalised with the names of the bride and groom and the date of your wedding so you can keep one as a special memory if you so wish. Inside, the text can also be personalised to include the venue, time and any other information you would like your guests to know. The invitation itself is comprised of a wallet and a three-part insert, including a personalised invitation, bespoke guest information and an RSVP. All three components are held together with a pale blue satin ribbon which can also be used to tie the wallet closed.